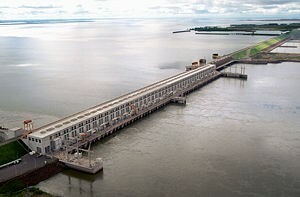 The firm directed a joint-venture baseline (post-construction) sedimentation study at the Yacyreta reservoir on the Rio Parana between Argentina and Paraguay. The Parana has a watershed of approximately 1 million km2, mostly in Brazil, and has experienced peak discharge at the damsite of 30,000 m3/s (1 milllion cfs). This study included bathymetry, analysis of sediment yield, sediment transport modeling, prediction of life-of-reservoir due to sedimentation, and conceptual identification of potential sediment management options for future implementation.